Yes, I am suggesting you turn on your oven during the summer. 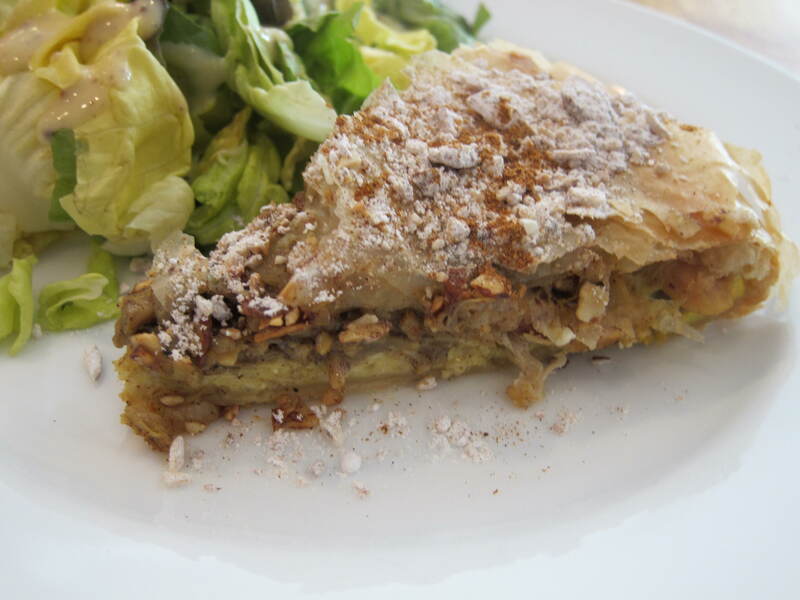 You can always eat on the patio, or take your Filo Pie to the park as a picnic. I’ve tried to simplify the recipe down to essentials trying to make this dish doable for a weeknight. Heat a large skillet over medium high heat and add the Olive Oil. Add the Chopped Onion and Salt and Pepper (to taste) and saute for 5 minutes. Add the Chicken and brown for 10 minutes. Add 2 tablespoons of the Spice Mixture and stir to combine with the Chicken and Onions. Add the Chicken Stock, stir to combine then reduce the heat to a simmer and cover for about 10 minutes or until the Chicken is cooked through. Set aside to cool. Loosely scramble the Eggs, adding a pinch of the Spice Mixture. Set those aside to cool as well. Once the filling has cooled you can assemble the pie. I spread the Chicken Filling on a plate and put it in the freezer for 5 minutes. Melt the butter and lightly brush a pizza or sheet pan. 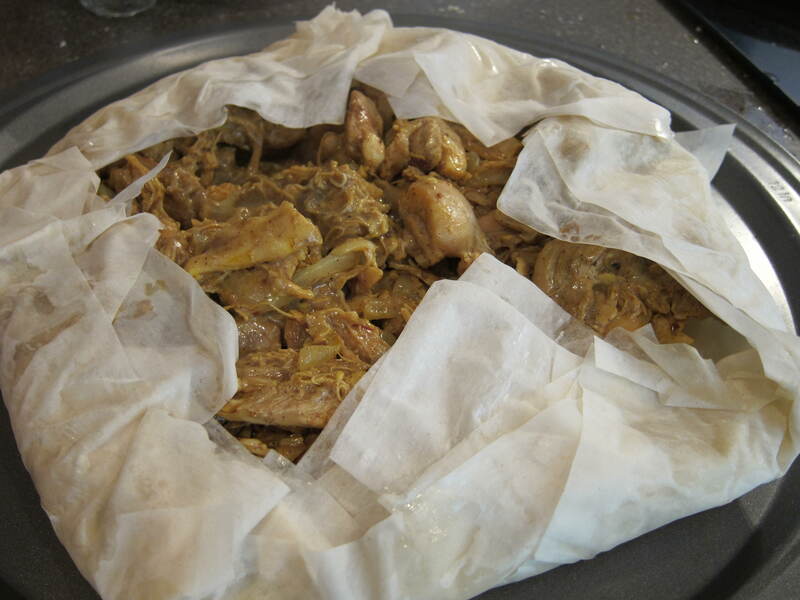 Unroll the Filo Dough and use 10 sheets for the bottom layer. One sheet at a time, layer them into a circular pin wheel fashion, brushing them in between layers with butter. Let the edges overhang the pan. Spoon the cooled Eggs onto this bottom layer. Spoon the Chicken mixture onto the eggs. Fold up the sides of the Filo around the filling. Brush the edges with butter. Using the rest of the Filo Dough over the open top of the pie, construct the pin wheel assembly again, buttering between layers and on top. Tuck the overhanging pieces of the dough under the pie. Bake in the preheated oven for 20 minutes. Then, using another pan on top, flip the pie over and continue to cook for an additional 20 minutes or until golden brown. Sprinkle with the Sugar and Almond Mixture and slice into wedges to serve. That is such a creative recipe! Genius! 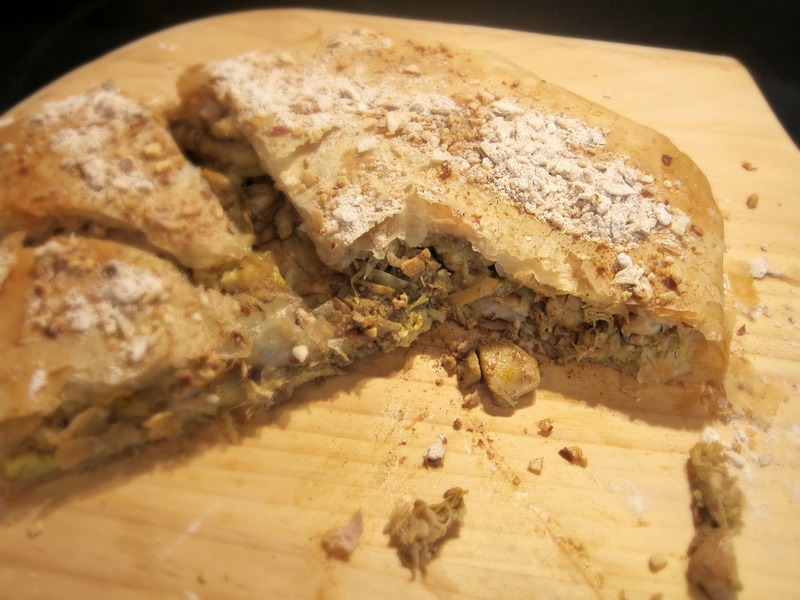 Your chicken filo pie sounds wonderful with all of its spices. I’m going to make this but will wait until the fall when having the warm oven on will feel good. By the way, when I was young my mother used to tell me “if wishes were horses, you would have a stable full”. Thanks! It’s true summertime isn’t the ideal time for this recipe. But, when a craving strikes you should go with it 🙂 Let me know how your pie turns out!